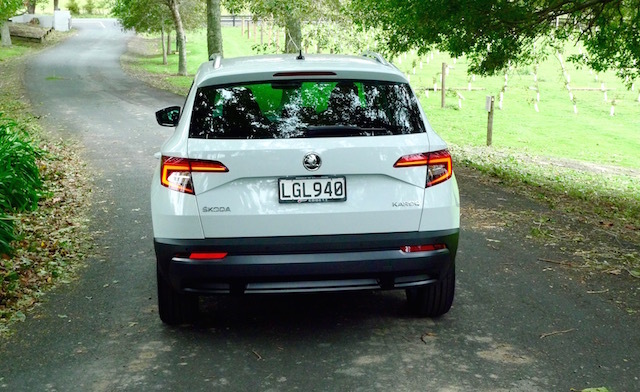 In 2003, Czech carmaker Skoda sold an average of two-and-a-half vehicles a week in New Zealand, its first year of re-entry after an absence of 10-12 years. Jump ahead to 2013 and it averaged 20 a week, breaking through the 1000 barrier. Now it has its sights on 2000, or 40 a week. But first, says Skoda NZ general manager Greg Leet, there’s the 2018 target of around 1800 registrations, or around five sales a day. Around 50 per cent of those will be SUV offerings, namely the seven-seat Kodiaq and its new sibling, the five-seat Karoq. Leet expects sales to be split 50:50. Other SUVs over the next couple of years, including an electric model (EV), will add to Skoda’s continued growth. What the new SUVs will be called isn’t known, but it’s a fair bet Skoda will follow its SUV naming protocol and mix and match handles to suit. The Yeti SUV name, for instance, was borrowed from Nepal’s mythical creature. Both the Kodiaq and Karoq names have their origins in North America. The Kodiaq gets its name from the world’s largest brown bear, an imposing critter found pretty much exclusively on Alaska’s Kodiak Island. One such example is pictured (above and below), with American wildlife centre curator Jim Kowalczik. 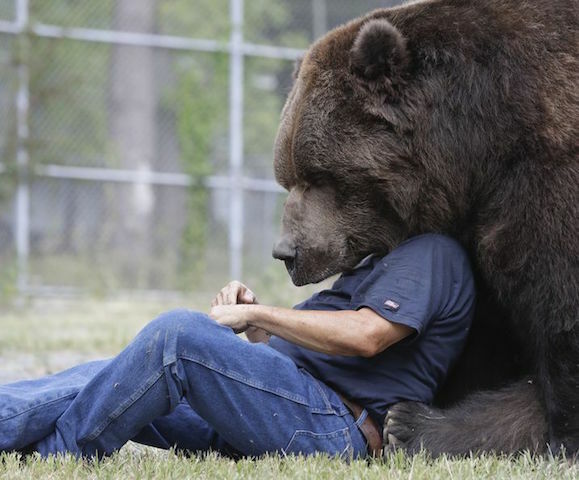 The bear’s name is Jimbo. 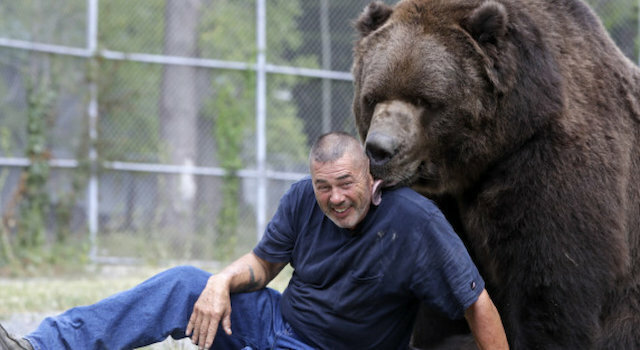 Kowalczik has had Jimbo for 22 years, since it was born in captivity. 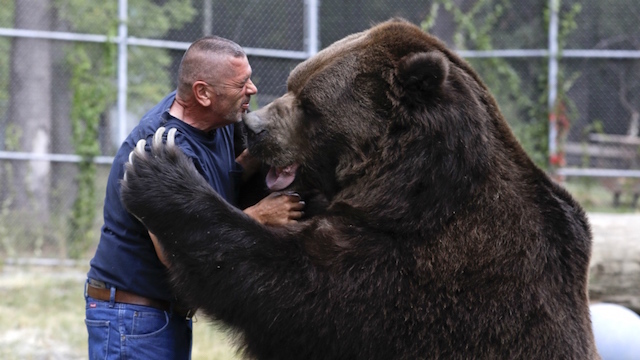 Man and bear regularly play together, although Kowalczik is always mindful of Jimbo’s power. “Think of the strongest person you know, or whatever, and magnify that by a thousand times,” Kowalckik said. Jimbo is now 3m tall on its hind legs, the top of its head mere millimetres below the height of an NBA basketball hoop. Jimbo weighs around 700kg. Kiwi basketball star Steven Adams is roughly one metre shorter and 600kg lighter. The name Karoq doesn’t share the allure of the Kodiak bear spirit in Native American mythology. It is a combination of the Native words for ‘car’ and ‘arrow,’ says Skoda. In the first instance, a reference to movement and expansion; in the second, a pointed direction of sorts. Leet says 72 per cent of Skoda owners are new to the brand. So what lures them? “They’re blown away by the bang for the buck,” he says. Mostly it’s the price and standard level of equipment, along with Skoda’s ‘Simply Clever’ add-ons, such as the velcro partitions in the boot and the umbrella under the Karoq’s passenger seat. British luxury marque Bentley also offers a ‘brolly. How come Safety is the last on the list? “I think it’s that customers these days just expect new vehicles to be safe,” says Leet. Karoq slots into the Skoda line-up as the replacement for Yeti, an adventurous model that was much admired. But the design of the quirky Yeti didn’t fit with Skoda’s plans (and those of its parent, the Volkswagen Group) to build SUVs with similar ‘family’ styling cues. Karoq had to look like a smaller version of Kodiaq. It does too, apart from dedicated design lines here and there, such as the restyled daytime running lights. Three Karoq models are available, two with a turbocharged 1.5-litre four–cylinder petrol engine driving the front wheels, and one with a 110kW/340Nm 2.0-litre turbodiesel providing on-demand all-wheel drive (AWD). All three use a seven-speed DSG gearbox. A petrol Karoq with AWD will land here later in the year. The two petrol models available now are the entry-level Ambition + ($38,990) and better equipped Style ($42,990). The diesel ($48,490) also carries the Style moniker. The 110kW/250Nm petrol unit is the first from the VW Group to use cylinder deactivation to cut fuel use and exhaust emissions. It’s also a first for New Zealand. On a light throttle, cylinders two and three in the inline-four shut down. A readout on the instrument cluster tells you when Karoq is running on two pots. The technology helps Karoq return a claimed town-and-around fuel use of 5.6 litres/100km (51mpg). Real-world fuel use will be higher than the carmaker’s findings – it always is – but the technology will nevertheless provide real-world savings for owners. SkodaApp for mobile phones can keep track of more Karoq data. A brief run at motorway speeds in both the petrol and diesel models revealed a preference for the front-drive petrol. It’s not just the appeal of the quieter engine, with its 250Nm available between 1500-3500rpm, it’s more the considerable weight difference between the two. The 1.5-litre petrol model is noticeably more nimble on its feet. Its kerb weight is 1320kg, or thereabouts. The 2.0-litre diesel is around 1480kg, or 160kg heavier. The difference is taken up not just with the heavier diesel engine and AWD componentry, but with the diesel’s multi-link rear suspension. The front-drive petrol Karoq has a less complex torsion beam rear set-up. There will be more interest from weight watchers when the AWD petrol Karoq arrives. Apart from the four-paw system, it gets the diesel model’s multi-link rear, a combination which will bump up kerb weight beyond 1400kg. The arrival of the AWD petrol Karoq is likely to coincide with the availability of an optional digital instrument panel in a dashboard that’s clean and uncluttered, much like Kodiaq’s. The fit and finish of the cabin is just as appealing as Kodiaq’s, and the cabin itself is roomy for the size of the vehicle. The main option at the moment is the Varioflex rear seat arrangement, $1750 on Ambition + or $2500 on Style models, where it’s bundled with leather and a few sports features. Varioflex allows the three individual seats to slide back and forward, tip up against the front seats, or be removed completely to maximise luggage space. With the three seats in place there’s 521 litres of luggage space. Tipping and fastening them flush up against the front seats provides 1605 litres. Take them all out and a whopping 1810 litres is available. Standard equipment on Ambition + includes autonomous braking and a package of driver alert functions. Style models get more goodies, including adaptive cruise control and powered tailgate.